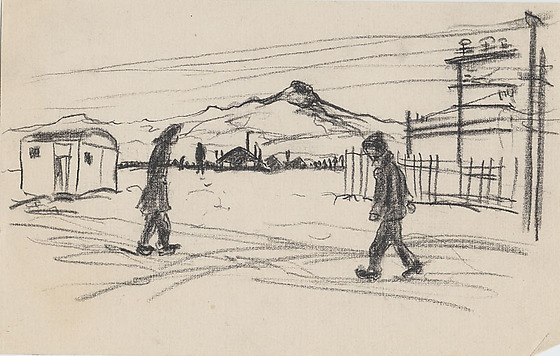 Pencil drawing on slightly textured paper of people walking in landscape of Heart Mountain, Wyoming on slightly. Dark shapes of two people walk toward each other across the foreground. White structure with dark roof at midground left ; fence around power lines, midground right ; another person is visible in the distance. Heart Mountain, center, rises in background above a mess hall and trees.